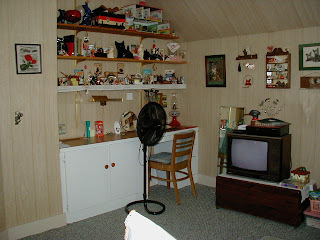 Amber's room was not part of the mold issue, it was just ugly. 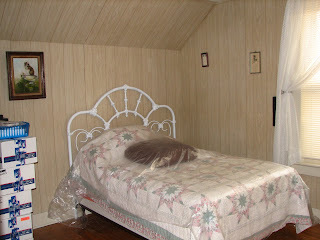 It originally had a drab gray paneling and the molding was not done very well. The interim before pictures below don't look so bad with just primer, but believe me it needed painted. The previous owner had built a built-in desk in the alcove area and shelves above it for his daughter Amy which was cute, but not made very well and was now 25+ years old so we tore it apart and use the alcove for the dressers instead. We never got more than the primer on the walls before it started being used as a guest room. See what I mean about the molding? Hubby has been a real trooper getting everything done on this house since so much of it wasn't even planned. I did the cutting in and the trim work while hubby did the rolling. We started early and finished just about dinner time after 2 coats of BEHR Oklahoma Wheat which dried very quickly. 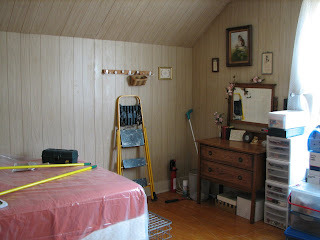 We do need to do the molding around the ceiling after the room has dried a bit more. We're going to stain it to match the closet and bedroom doors. It will give great contrast to the Oklahaoma Wheat on the walls and the Innocence on the ceiling. I just love the blues and sage green against the warm walls. Amber, your room is ready!